If you have any questions about the TC126 information page below please contact us. 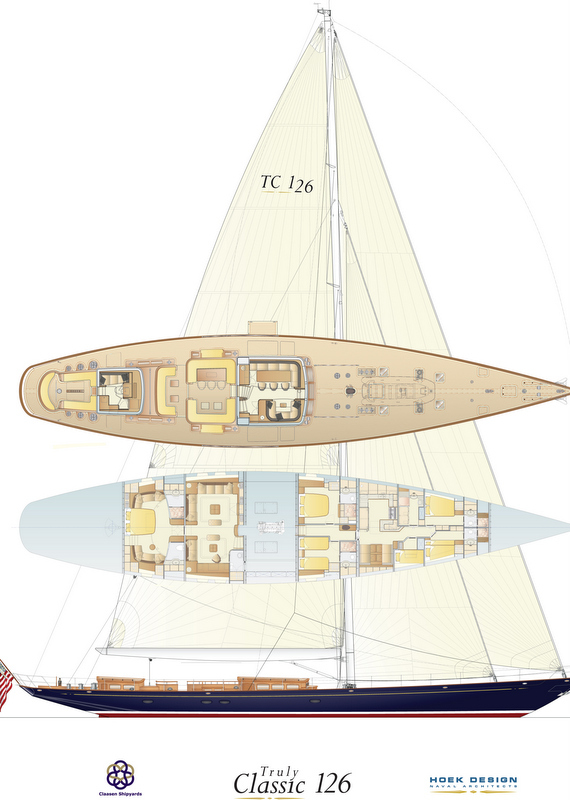 With launch in 2015, the 38-metre superyacht TC 126 is a spectacular sailboat, belonging to the Truly Classic series. Built by the well known Dutch manufacturer Claasen Shipyards, sailing yacht TC126 is developed by renowned Hoek Design. She is available in a Sloop-rigged as well as a Ketch-rigged version. 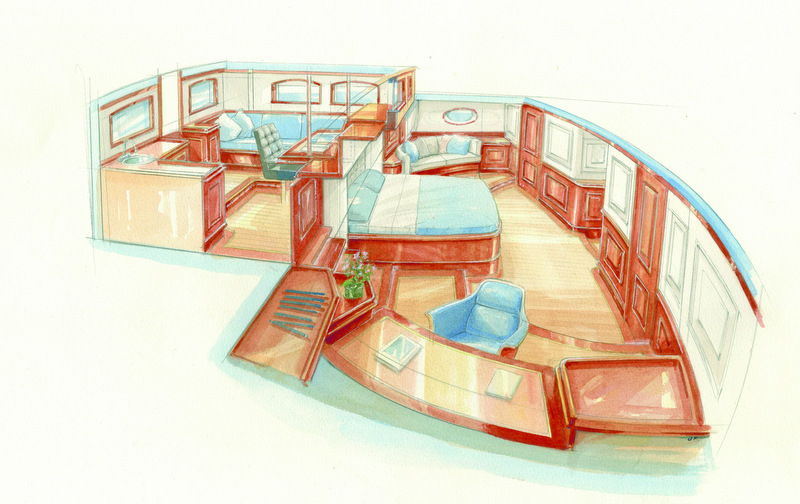 Accommodation aboard the Hoek designed superyacht TC126 is provided in 3 elegant and comfortable suites. There is an aft owner's stateroom leading to a private deckhouse and aft cockpit. Just in front of this, there is also a full-beam lower saloon, boasting a small fireplace to increase the air of cosiness. The further two guest suites are situated aft of the main deckhouse. The vessel's 5 professional crew sleep in 3 crew cabins, with a separate laundry, mess and galley. The aft cockpit of TC126 yacht features a helm station connected to a navigation deckhouse. At anchor this navigation station can be transformed into the owner’s office, providing privacy in the centre cockpit for charter as well as family cruising with a separation between crew and guests. 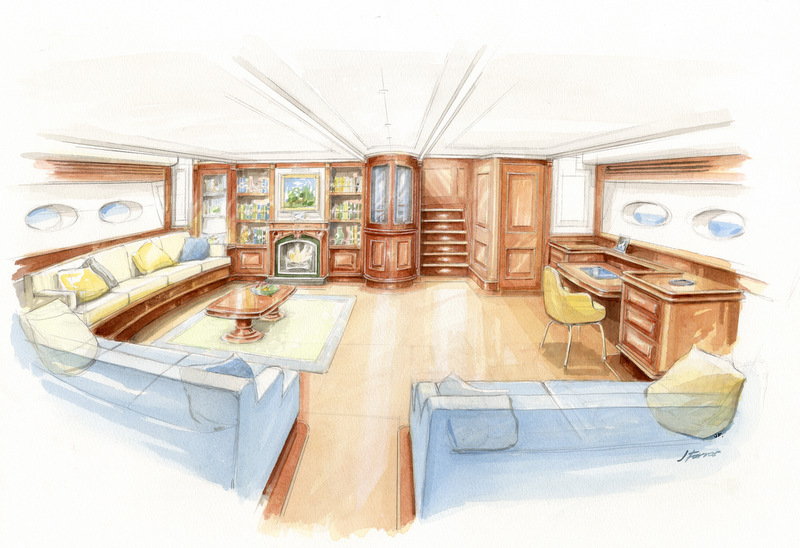 The main deckhouse offers a dining area to port, a settee to starboard and a small pantry. Claasen luxury yacht TC 126 is powered by a Scania main engine, which drives a controllable pitch propeller. There are also two Northern Lights generators. These serve as the main electric and hydraulic source. 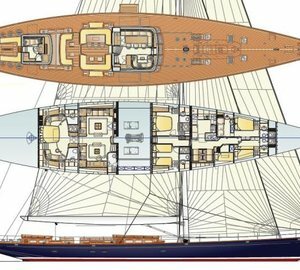 Luxury sailing yacht TC 126 boasts luxurious and comfotable accommodation, divided into 3 beautifully appointed cabins. These include the owner's stateroom, as well as two guest suites. There is also accommodation for 5 dedicated crew, sleeping in 3 crew cabins. We do have available further amenity, owner and price information for the 38.4m (126') yacht TC126, so please enquire for more information. The luxury yacht TC126 displayed on this page is merely informational and she is not necessarily available for yacht charter or for sale, nor is she represented or marketed in anyway by CharterWorld. This web page and the superyacht information contained herein is not contractual. All yacht specifications and informations are displayed in good faith but CharterWorld does not warrant or assume any legal liability or responsibility for the current accuracy, completeness, validity, or usefulness of any superyacht information and/or images displayed. All boat information is subject to change without prior notice and may not be current.